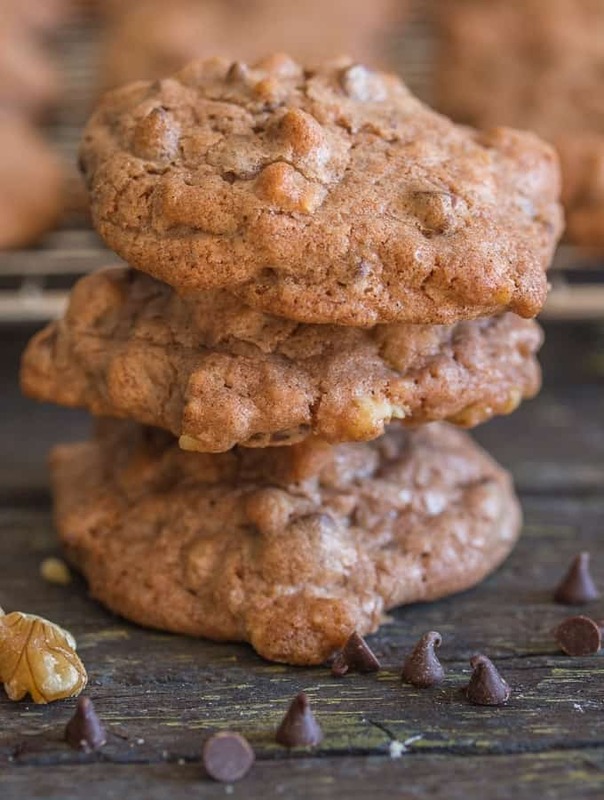 Chocolate Chip Walnut Cookies are a fast and easy drop cookie, made with dark chocolate, chopped walnuts and mini chocolate chips. So good you will be making these over and over. “These are one of the best Cookies you have ever made” a direct quote from my husband. And yes he loves walnuts, actually any kind of nut! 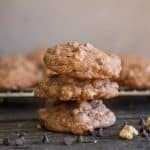 Mix them up with some chocolate chips in a soft drop cookie and he is all over them. It’s was actually quite difficult for him to share. Whenever I bake I like to share, either with friends or family. I always know when something is way too good to share, when the Italian says “nope these will stay right where they are”! 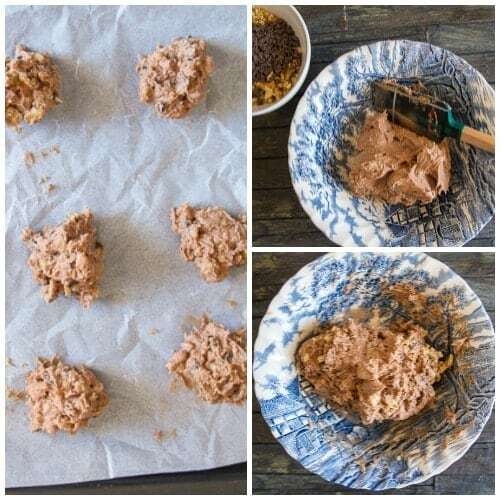 and sometimes like these Chocolate Chip Walnut Cookies all you do is mix them up and drop them by spoonfuls on a parchment paper lined cookie sheet. All these different ways of making cookies produce delicious cookies but sometimes you want a cookie and you want it now! 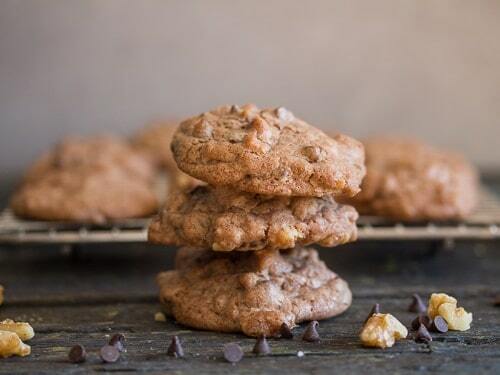 So these Chocolate Chip Drop Cookies are perfect, especially when you add walnuts. Enjoy! Pre-heat oven to 350F (180C), line a large cookie sheet with parchment paper. In a large bowl beat on medium speed the butter and sugar until light and creamy approximately 5 minutes, then add the egg, vanilla and melted cooled chocolate and beat to combine. Add the dry ingredients to the creamed butter mixture and combine with a wooden spoon or spatula, then fold in the walnuts and chocolate chips. 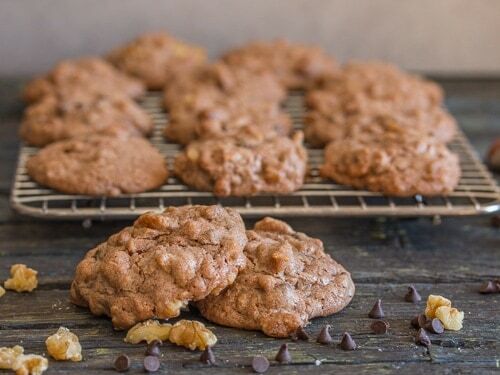 Drop by spoonfuls on prepared cookie sheet and bake approximately 10 minutes. Let cool completely before serving. Enjoy. Pls indicate when the mini chocolate chips should be added. I made a batch & did not add the chips. I made a second batch & added the chips after the walnuts. Was that the point to add the chocolate chips? Hi Bessie, sorry about that, I adjusted it, they should be added with the walnuts. Thanks Have a great Sunday. Love trying otu italian cookies love this site. Hi Carol thanks so much. Have a great week.